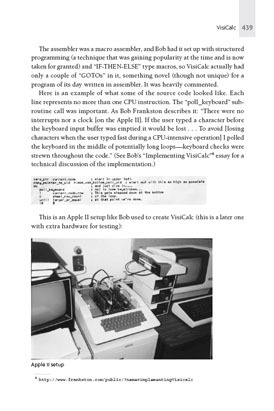 This essay covers the process I went through to produce a book, Bricklin on Technology, based upon material I had previously published on the web. It is not meant as a "how to" for everybody but rather as food for thought for others considering doing the same. A lot of the information I see on the Web about doing this is centered around how to get a book contract, or how to structure your new blog as a gateway to a book, or publishing it yourself. Like many bloggers, I had access to publishing through success in other endeavors and through success of my blog. My issue was more about extracting something for print and getting a whole which is greater than the sum of its parts, while preserving the feel of the original. 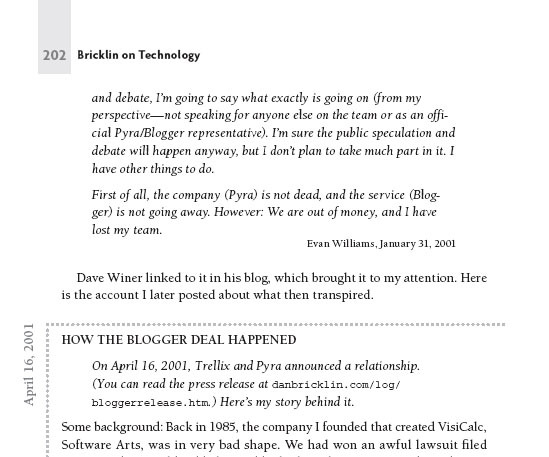 In November 2007, I was approached by a senior person at John Wiley & Sons about writing a book. He had seen my essays and blog posts on my web site. He, and later others at Wiley, told me that having all that material already in hand was a way to make creating the book fit into my limited time availability, since I had "already written" a lot of it. While having a lot of material to start with helped, it turned out that there was still a lot more to write and do to create my book. Over the next several months, I had phone discussions and worked on a book proposal with Carol Long, who is Executive Acquisitions Editor for Wiley Technical Publishing (the division that published my book). In the proposal I wrote: "The content is based upon his well-regarded writings, reporting, and recordings over the last 10 years, with new editing and commentary to bring them up to date and integrate them, and to look at them with a modern perspective." In mid-April 2008 we signed a book contract. They wanted 250-350 pages by November 3, 2008. I had lots of other consulting work to do and by June only part of what became the Introduction chapter done. After a while I got to work on the book again. This time I started working on producing a complete chapter. 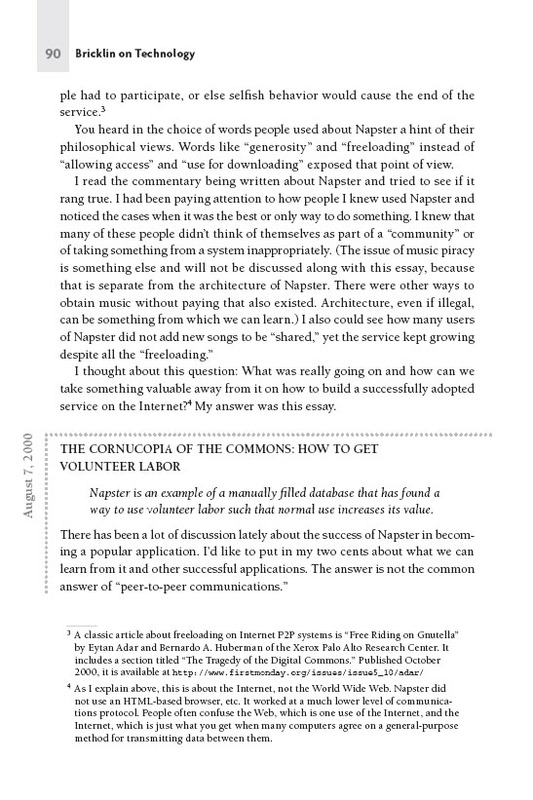 I knew that my "Cornucopia of the Commons" essay would be in the book, so I decided to see how I would turn that from a web page into print. It was an interesting challenge. There have been many blogs that have been "turned into a book," so what was my problem? Most of the books of that type that I've seen were really just reprints of essays or how-to entries, or "based" on the stories in the blog as a starting point. They didn't really take the feel of a web site like mine, with its connectedness to other people and their writings on the Web, and translate it into print. The Cornucopia essay was especially challenging, because it was written partially as a reaction to other writings, and had links to responses, and responses to the responses. Also, a few years later there were a series of blog posts on my site and others that related to the original essay. This didn't lend itself to just a simple reprint of a series of paragraphs of plain text. Nor could I just put in footnotes with links and expect the reader to stop reading and run to their computer to see what they pointed to. Worse yet, many of those links were now dead, pointing to old web sites. Since some of my essays are "classics" referred to by other writers, I wanted to leave them as much like the original as possible and not rewrite them to clean up old mistakes. I also didn't have time to write 350 pages from scratch. I also had a variety of different types of online material to present. There were essays: Long form writings meant to stand on their own like a magazine article or white paper. There were blog posts: Usually shorter pieces than the essays written with an implicit assumption that they were read as part of an ongoing discussion or in the context of following a link from another web site. There were also podcasts: Recordings of events I attended or people that I interviewed. My first thoughts were back to discussions we had in the early days of my old company, Trellix, in the mid-1990s. We were producing a tool for writing "documents" that consisted of many linked pages, like Help files. We eventually ended up with a web site creation tool. One concern we had was with printing the entire contents of documents. We looked at a variety of techniques that have been used in the past in the print world for dealing with drilling down to more detail and linking, but never had time to pursue them. 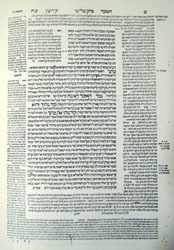 On the left is a page from an early printed copy of one of the books of the Talmud, dating from 1554. 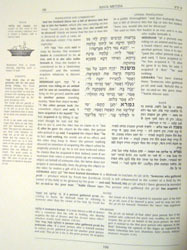 (It is from Printing the Talmud, ISBN: 0-9626445-0-1.) The Hebrew and Aramaic material in the Talmud started out being passed down from generation to generation orally, and was then later written on parchment or vellum by scribes. When movable type printing was developed, the text of the thousand-year old (at the time) discussion of laws was printed along with various related commentaries. 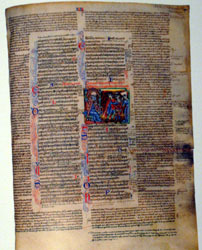 You can see the main body of text in the middle, surrounded by a variety of different commentaries, references to other texts, and other notations. In the middle is a modern, English version of the Talmud (The Talmud: The Steinsaltz Edition, ISBN: 0-394-57666-7). The main Hebrew and Aramaic text is still in the middle of the 11 1/4 x 9 inch page. The English translation is on either side, one literal and the other with additional commentary interspersed. Below and on the far left are explanatory notes about various phrases and concepts. On the right is a hand written manuscript from the year 1234 (A History of Illuminated Manuscripts, ISBN: 978-07148-34528). It consists of Church law surrounded by commentary. Being inspired by the Steinsaltz design, I took a copy of the Cornucopia essay and started marking it up with extra material bracketed as "Commentary," "Sidebar: Explain how Napster works," "Link Target Details," "Hindsight," "Follow-up," "Major Point," and more. I imagined having it all printed in a clear, two-dimensional layout with appropriate typographical styles to distinguish the different types of material that I was adding to the original. I sent this to my publisher. Then I got the bad news. As a technical book publishing division, they had certain ways of producing books already set. That helped them turn out such books quite quickly before the technology topic and information became stale. They needed to be able to use Microsoft Word, with styles, as the raw markup medium. They could do a little handwork when converting it to desktop publishing, but they couldn't handcraft every page like the Talmud. I was stuck with a 9 by 6 inch page. So much for my vision of hypertext on paper. Writing "today" with introductory text, transition text from one old writing to another, and reflection in hindsight. The original essays and blog posts, as well as new, not-yet-published essays. Quotes from other writers, including entire blog posts and essays. Comments to explain or complement specific items in the other text. 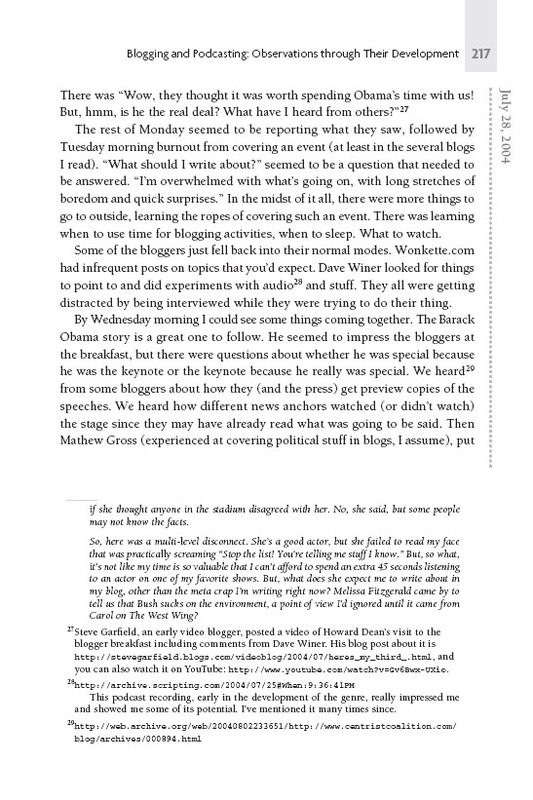 In many other books, self-contained essays, etc., in the flow of "new" text often is shown as a sidebar, sometimes with a gray background to help it stand out, or indented. I decided that that would not work here: Too much of the book was that material and many of the essays and blog posts were more than one page long. 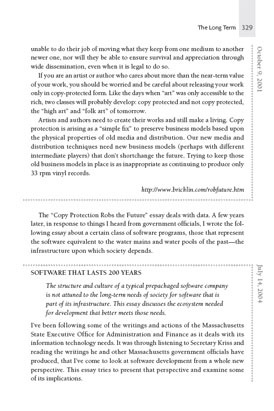 Printing it all on gray would lose the fact that it is called out, and it would be hard to know on any given page what you were reading or when it was from. Likewise, indenting loses its distinctiveness when an entire page is indented. I decided to have the blog posts and essays start out with subheads with their publication date (for the blog posts), title, and summary sentence (for most essays). In the margin, there would be a light gray, thick dotted line along with the date of original publication displayed vertically. That way, you could distinguish between me talking now, the original writings, and one writing vs. another. The dates on the side are to help the reader put the writing in context (for example writings about Napster before it was shut down or Barack Obama before he ran for president). I decided to use traditional footnotes (on the page, not as endnotes) as a way to include the comments that complemented the text at specific points. I also decided to use the same set of footnotes to list URLs, though in a different, mono-spaced font. This sort of gets the effect of the Steinsaltz style of comments across the bottom of the page. (The small page size meant that I really couldn't use multiple columns to include commentary or other supportive text.) The number of footnotes varies depending upon the nature of the text. Some sections average over one footnote per page, some somewhat less. Here are a few pages with a variety of footnotes as an illustration (they are not typical in the length or number of the footnotes). 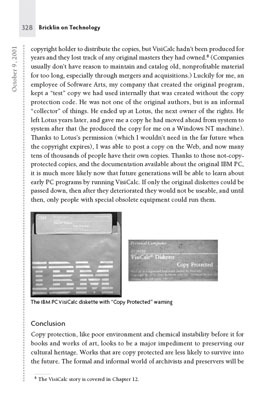 Note that one of the URLs ended up being to an Archive.org copy -- something very common throughout the book. Quoting a lot of people in a book takes a lot of work. You need to follow various copyright guidelines. While publishers usually allow you to include small amounts under fair use, any large section that you copy, or private correspondence like email, requires an agreement from the author. To be considerate of the authors, including bloggers and book authors, I tried to get an OK even for much of the material with named attribution that I could have included under fair use without permission. All of those OKs amounted to tracking down and contacting about 50 people in my case, many of them with signed permission agreements and many of them people I had never met. The permissions issue also affected the use of photographs. Almost all of the photos on my web site are ones I took myself, which makes things easier since I own the copyright. However, to use a photo of a recognizable person in the book I really should have permission from them, too. That would have taken way too much work, and wasn't possible with some of the images where I don't know the names of the individuals. So, a few pictures have been edited to remove recognizable faces, and many of the pictures that were on the Web or that I had of people who were mentioned were not included. I did get permission from a few people, like Malcolm Gladwell and Ward Cunningham, who I was contacting anyway. There are still about 100 images in the book. Some of the book consists of transcripts of podcasts I published of interviews with a few individuals. I had the MP3 files transcribed by CastingWords.com. The transcripts were pretty good, but not perfect. I had the transcribers include timecodes in the text and have preserved those in the final copy. This made it much easier for me to check the recording with the transcript and should be helpful to readers who want to listen to a particular section. Once I worked out how I would present the material, I had to figure out which of the many things I've written should be included and in which order they should appear. Much of my material was originally written to stand on its own without regard to flowing cleanly into the next piece, which is one of the important properties of a blog and web site like mine. Things are presented as chunks: single web pages, blog entries (posts), or recordings. They are linked to each other and to other pages and posts on the web, but the order of reading was never fixed, except perhaps chronologically in the order in which they were written. On the web, most people would read only one piece at a time, either because they were following my writings on a daily or weekly basis, or, more commonly, because they were directed to that particular piece by a link on somebody else's web writing, through an email, or as the result of using a search engine. Everybody reads a different set of pieces of the material and in a different order. A book is different. It has a definite preferred order, and you expect people to go from one page directly to the next with few pauses. I then took those few hundred pages and started looking through them and placing them in piles on the floor of an empty room. Each pile developed as I thought some writing was closely related to another, either because it was a series or on the same topic. I ended up with over 20 piles. Looking over the piles I found that some were similar enough and put them together. I then started counting up the number of pages, knowing from my testing that the printed out pages more or less corresponded to printed pages in the book. From that I cut down to about a dozen or so piles that met my target number of pages and that fit together well, deciding to not cover certain topics. I ended up with two main parts to the book: The first part is about some sociological and business aspects of technology, and the second part is more about the specifics of technology-based "tools" themselves and the development and evolution of those tools. I then took those piles of pages and put them in a big loose-leaf binder, separated by dividers. I then went through my new "book" ordering and reordering the items and the sections themselves. I could feel the book coming together. At this point I could see places where other writings that I had rejected or not come across in my scan would fit as good examples or transition material. I printed them out and added them. The book started growing. The next step was to take the computer-readable text of the parts of each section and create initial chapter drafts. I now had the stuff that was "already written" but little else. I created a more complete table of contents, explaining the different chapters and how they related to each other and put that in the Introduction. That then served as a guide for making the book flow. You'll find a copy of that in "The Structure of this Book." My first chapter, the Introduction, is mainly new material (about 17 pages worth). That was mostly completed at that point, with feedback from an editor. I also had a little extra material for the part on the Cornucopia of the Commons. Other than that, I started going through each chapter, applying the word processor styles I developed, and filling in all the space "around" the existing material. There were introductions to write, sometimes many pages in length, sections explaining concepts, links to check and add as footnotes, and explanatory footnotes to write. There was transition text to serve as the bridge from one piece to another, as well as between one chapter and another. Following the links in the original or looking up concepts in search engines I found other material that I could include. I had to decide whether to include a link, an excerpt, or perhaps an entire blog post. I ended up deciding to use full posts from a variety of different writers, including Dave Winer, Clay Shirky, and Evan Williams. Then I needed to contact all of the authors to get permission. Over the years I had gotten ideas from various books and made reference to those ideas when I discussed some of the topics that are in my book. I needed to track down explicit quotes to include, with appropriate attribution information, and again get permission. I kept reading through each chapter, trying to refine it, sometime reorganizing. I had a few relatives and friends who read some (or in one case, all) of the material and gave me feedback and did some copy editing. I made corrections and tried to explain concepts that they found unclear or foreign. I added photographs that were appropriate in addition to the ones that originally appeared on the Web. I left most of the text of my old writings, and those of others, as it was originally written unless asked by them to make changes. For some of my old writing I made grammatical changes suggested by others to improve understanding. The book grew. All this new material added to the page count. Carol Long said not to worry, that it would just add to the value of the book. I suggested removing one of the interviews since it was more technical than the rest of the book and took up 40 pages, but she reminded me that it was part of the original proposal that others at Wiley had liked. I had to add footnotes and subheads to that transcript to make it easier to understand and to skim. I thought I was struggling to get up to 300 pages, and now, with index, I was struggling to stay under 500 (it ended up 512, including front material and index -- 475 for the main text). At least with the way the book is formatted, if any part of it gets boring or too long it is easy see where to skip ahead to a new section. The more I read the material the more I found recurring themes. It wasn't until I put it all together, my material and that of others, that I saw how clearly some of those themes flowed throughout the book (I'm still finding them). That helped me write the conclusion. 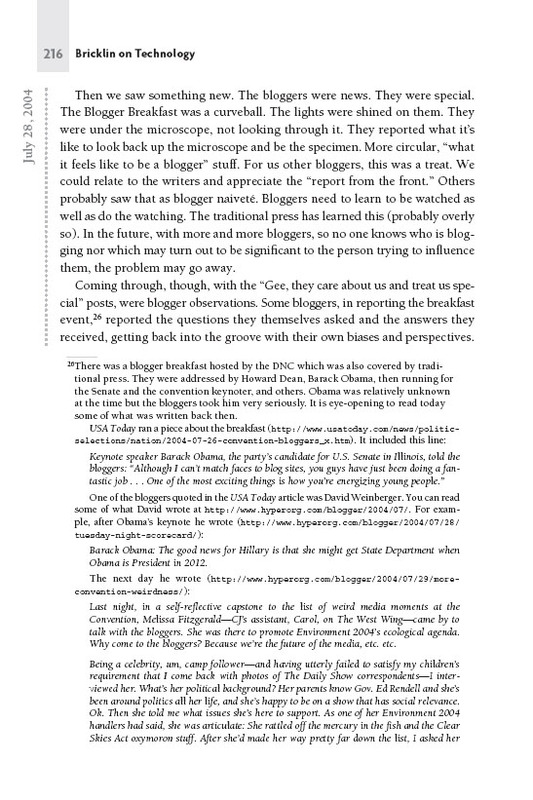 Sometimes you find nuggets that are gems in hindsight, like David Weinberger's prophetic observation written during the 2004 Democratic National Convention, shown above, which I added in October: "Barack Obama: The good news for Hillary is that she might get State Department when Obama is President in 2012." Once it was all together I sent my drafts off to the publisher (by November 3rd -- I try to ship on time) where it went through a few editing passes. First I got back some comments and some grammatical corrections. I went through all those and addressed them. Then came another pass, this time from a more detailed copy editing. I went through all of those. Then another pass as it was sent through layout. Each time they and I found errors to correct, some dating back to a many-year-old original post. (I'm still finding problems after it's too late to make corrections, some that come from problems with URLs. You'll find some of the corrections listed on the Errata page. I guess software isn't the only place you always find more bugs as time goes on.) I had to look at their suggested changes carefully -- some would change the meaning inappropriately. This is especially a problem with transcripts. I tried to keep the transcripts as true to the audio as possible, which ends up with English that does not flow very well. Some technical terms sound just like other words. It required careful reading (and sometimes very careful listening). Finally, I had to go through the index the publisher produced. Again, as I posted on my blog, it takes a lot of work. As I write this the book is at the printers and I am awaiting my first copy which is scheduled to start shipping to book sellers at the end of April. At that point I'll finally see how this all came out. I hope that it and what I wrote here is helpful to others to understand what I did and perhaps to help them in turning their own work into print. I also hope you like the book and find it worth all the work that went into it. I was interviewed by host Phil Windley for the Technometria podcast on IT Conversations on May 4, 2009. Early in the interview he said (at 3:18) "If any of the listeners have any hesitancy about a blog that got turned into a book, don't have it about this one because this one, actually, I found to be fascinating." When I asked "Did it work for you guys?" (34:30) Phil answered, "Yeah. It did. When I saw what you've done, I thought, you know, if I really wanted to put my blog into a book, this is a good model . . . I think the biggest surprise for me was just the way you had taken material, spread out across time, brought it together into topics and written around it to give it context, and then you set the blog posts off separately with this kind of dotted line format around it -- that made it all work for me. I said, OK, I see how this could work now." Phil's friend Scott said, "When I first saw the book and how large it was I was thinking, oh my gosh, that's a ton to read, but what's fascinating, like Phil said, is that once I got in and started reading it actually flows well."